Cysts; Esophageal Cyst; Mediastinum; Thoracic Surgery, Video-Assisted; Endosonography. 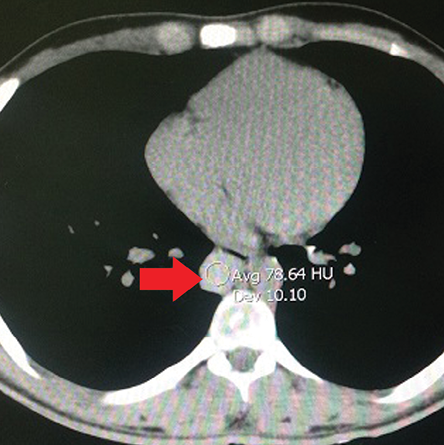 A 24-year-old man, with no history of medical or surgical problems, presented to the Armed Forces Hospital, Oman, as a referral case because of the incidental ﬁnding of a mass in his chest X-ray. The patient denied any history of dysphagia, dyspnea, or chest pain. Figure 1: Chest X-ray revealed a mediastinal mass on the right side of the chest at T8 and T9. Figure 2: Computed tomography of the chest showing the mediastinal mass. A physical examination revealed no abnormalities, and his biochemical and hematological markers were all within normal limits. Review of the chest X-ray showed a mediastinal soft tissue mass on the right side of the chest at T8 and T9 [Figure 1]. Therefore, a chest computed tomography (CT) and a magnetic resonance imaging (MRI). 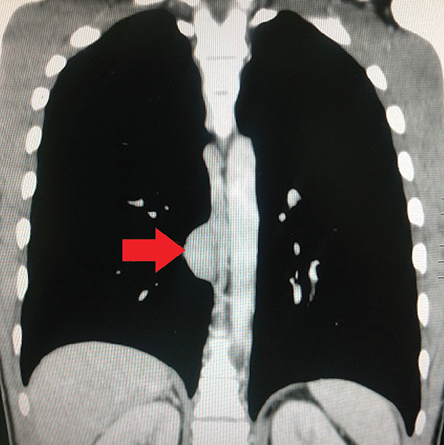 The CT scan revealed a posterior mediastinal mass in the right lower one-third of the paraesophageal area. The mass was isodense, mildly-enhancing and inseparable from the wall of the esophagus [Figure 2 and 3]. On the other hand, the MRI showed a well-deﬁned cystic lesion in the right paravertebral region at D7 and D8 vertebral levels inseparable from the wall of the esophagus. The cyst measured 3.7 cm × 2.3 cm × 1.5 cm. The lesion was hyperintense on both T1- and T2-weighted images and showed no enhancement after contrast [Figure 4]. 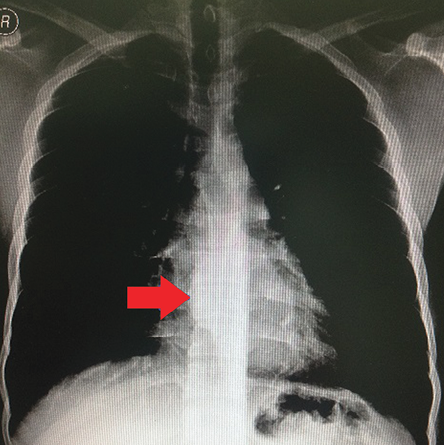 A barium swallow test was normal apart from a small impression on the posterior aspect of the lower esophagus [Figure 5]. Esophagoscopy showed smooth impression in the posterior aspect of the lower esophagus. No luminal communication between the esophagus and the cyst was identiﬁed. An endoscopic ultrasound revealed an intramural esophageal cyst within the lower third of the esophagus. The findings were consistent with a congenital duplication cyst arising from the lower third of the esophagus. Therefore, the patient underwent a VATS excision of this esophageal cyst under general anesthesia, with left-sided double-lumen tube and single lung ventilation [Figures 6, 7, and 8]. The cyst was completely resected, the esophageal muscular layers preserved, and the esophageal mucosal integrity was maintained. The patient had an uneventful recovery after surgery and was discharged after five days. Histopathology examination showed the lining of the cyst wall by ﬂattened and pseudostratiﬁed ciliated columnar epithelium overlying double layers of thick bundles of smooth muscle ﬁbers. This finding supports the diagnosis of developmental esophageal duplication cyst [Figure 9]. The patient remained well on follow-up visits. Figure 3: Axial computed tomography of the chest showing the mediastinal mass. 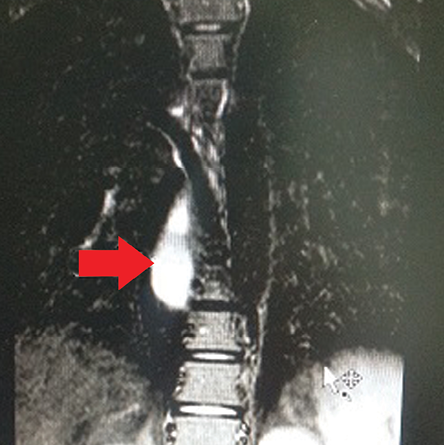 Figure 4: Magnetic resonance imaging of the chest showing the mediastinal mass. 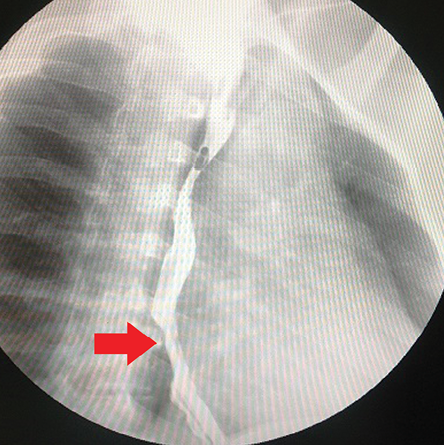 Figure 5: Barium swallow revealed ﬁlling defect in the lower third of the esophagus. Figure 6: Thoracoscopic view of the esophageal cyst. The presentation of this condition in adults is usually with complications, but it can also be diagnosed incidentally on routine imaging of the chest.7,8 Whenever a mediastinal mass is suspected, a CT scan should be done to delineate posterior mediastinal lesions and to distinguish between the esophageal or bronchogenic origin of the cyst. Additionally, it is important to differentiate foregut lesions from other mediastinal lesions such as hydatid cysts, Mullerian cysts, bronchogenic cysts, pericardial cysts, or cystic degeneration of mediastinal tumors like leiomyoma of the esophagus.3,7 However, when a neurenteric lesion is suspected an MRI would be helpful to detect vertebral and intraspinal anomalies and, therefore, would be the diagnostic investigation of choice. Endoscopic ultrasound (EUS) is also widely used in diagnosing and further characterizing mediastinal masses. EUS is used to differentiate esophageal lesions from bronchogenic lesions in one of three ways; proximity to the esophagus, absence of cartilage, and the presence of a double muscle layer covering the cyst.5 Furthermore, EUS is a useful tool for differentiating between cystic and solid esophageal lesions like esophageal leiomyoma, which has almost the same presentation. Barium swallow and esophagoscopy are used as primary investigations for dysphagia, and they can demonstrate esophageal narrowing and sometimes ﬁstula between the cyst and the esophagus. The deﬁnitive diagnosis is obtained by the histopathological study of the excised cyst.2 Technetium radionuclide scanning done in patients presenting with ulceration, bleeding or anemia may show gastric mucosa in the cyst. 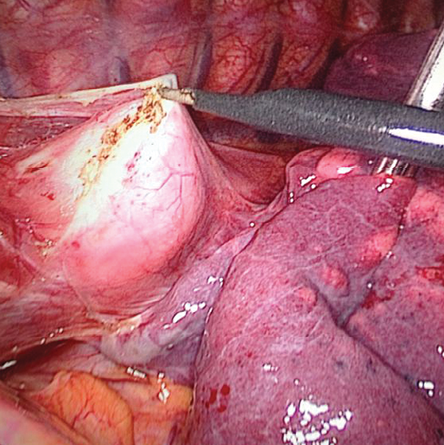 Figure 7: Video-assisted thoracoscopic surgery dissection of the esophageal cyst. Figure 8: Dissection after aspiration of the cyst. Figure 9: Histological appearance of the cyst wall with the muscle layer. Esophageal duplication cysts are rare. Patients may be found incidentally or present with cyst-related complications such as hemorrhage, perforation, and compression symptoms. CT and in some cases MRI is needed for assessment of the lesion and planning for surgery. 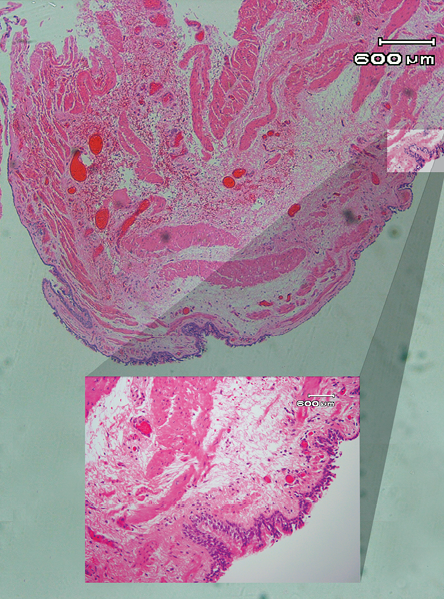 Histopathology remains the deﬁnitive diagnostic tool of esophageal duplication cyst. 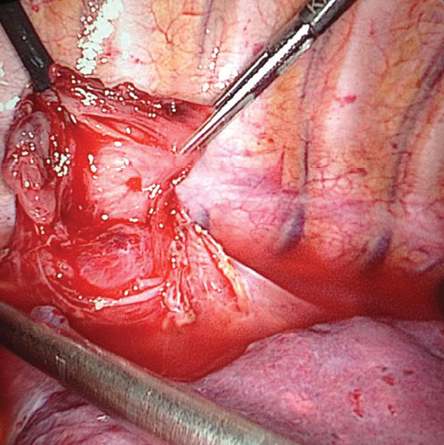 Surgical excision of the duplication cyst is the treatment of choice for both symptomatic and asymptomatic cysts. We would like to thank the radiology and pathology departments at the Armed Forces Hospital for their assistance. Mueller DK Esophageal Cysts. Available at http://emedicine.medscape.com/article/426589-overview. Accessed May 11, 2015. Zhang Z, Jin F, Wu H, Tan S, Tian Z, Cui Y. 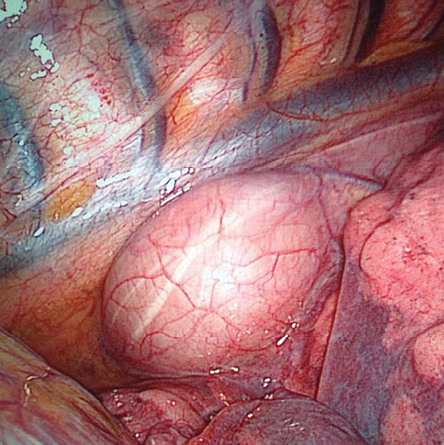 Double esophageal duplication cysts, with ectopic gastric mucosa: a case report. J Cardiothorac Surg 2013;8(1):221. Chaudhary V, Rana SS, Sharma V, Sharma AR, Nada R, Gupta R, et al. Esophageal duplication cyst in an adult masquerading as submucosal tumor. Endosc Ultrasound 2013 Jul;2(3):165-167. Gupta B, Meher R, Raj A, Agarwal S. Duplication cyst of oesophagus: a case report. J Paediatr Child Health 2010 Mar;46(3):134-135. Pisello F, Geraci G, Arnone E, Sciutto A, Modica G, Sciumè C. Acute onset of esophageal duplication cyst in adult. Case report. G Chir 2009 Jan-Feb;30(1-2):17-20. Al-Majali RM, Al-Hiari AA, Alaween ZF, Ahmed KK. Mediastinal foregut duplication cyst: A case report. JRMS 2004 Jun;11(1):48-50. Parikh DH, Crabbe D, Auldist A, Rothenberg S. Pediatric Thoracic Surgery. Springer Science & Business Media; 2009. p593. Takemura M, Yoshida K, Morimura K. Thoracoscopic resection of thoracic esophageal duplication cyst containing ectopic pancreatic tissue in adult. J Cardiothorac Surg 2011;6(1):118. Ivekovic H, Jouret-Mourin A, Deprez PH. Endoscopic fenestration of esophageal duplication cysts. Endoscopy. 2012;44(Suppl 2 UCTN):E404–E405.